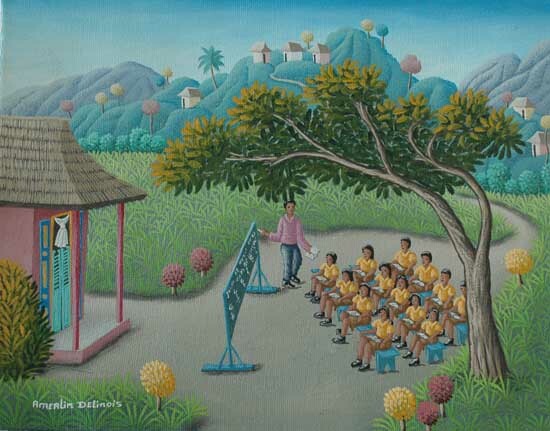 Amerlin Delinois was born in Les Cayes, Haiti on May 24, 1958. His father is a farmer and his mother a commercant, selling merchandise. At age 18, he moved to Port-au-Prince to apprentice to an auto mechanic, eventually rising to a highly skilled level called "bosmecano". During this time he began to paint. At some point he also became a truck driver in the Department of Public Works. He maintained both careers until 1991 when he decided to devote all his time to painting. He has seven children and lives in Port-au-Prince. This biography was borrowed from the Book "Artists in Haiti, 100 Among Many"